ANDREW GALE spoke with what Yorkshire first-team coach Jason Gillespie called “quiet authority” to the players after a dreadful bowling performance in the opening session of this match. Perhaps that meant that the Yorkshire captain cursed in more restrained manner than was warranted after his side conceded 77 runs in 15 wicketless overs after winning the toss en route to shipping 132 runs in the session all told. Yorkshire's captain Andrew Gale (Picture: Martin Rickett/PA Wire). For reasons known only to the cricketing gods, Yorkshire’s much-vaunted pace attack got their lengths wrong and generally bowled much too full. It was certainly not the standard one has come to expect from the county champions, and it left Gale and his colleagues playing catch-up in one of their biggest fixtures of the season. Whatever Gale did say at lunch in the confines of the dressing room certainly had the desired effect – not only on an opening day when Yorkshire recovered to dismiss their hosts for 261, but also yesterday when they produced a bowling display that was the antithesis of their first innings effort. The smoke from Gale’s collective rocket was almost still visible as Yorkshire put the squeeze on their opponents to the extent that they closed day three on 151-5 from 60 overs, a lead of 122, after Yorkshire replied with 290 to gain a first innings lead of 29. Indeed, when a batsman as dashing as Alex Hales manages just 34 runs from 115 balls in two and a half hours, as though transformed into a modern-day version of William Scotton, the famously dour Notts opener of the 19th century, the accuracy of the bowling speaks for itself. Yorkshire were impressive, and they go into the final day hopeful of recording their first win of the season at the third attempt. The visitors had also fought back impressively with the bat from 24-3 when they resumed yesterday on 170-4, 91 behind. Alex Lees had hit 91 of those to close in on his first hundred since he made exactly 100 in the corresponding match just over a year ago. The left-hander deserved a century as much for the character he showed as anything else, but he added only one to his overnight score before edging left-arm pace bowler Harry Gurney to wicketkeeper Chris Read. Read had dropped Lees on 88 off the same bowler on the second evening when the score was 165, and he would have been as relieved as he was pleased to claim what was his 900th catch for Notts, a statistic that reflects a superb career. Gale, who resumed on 21, would probably like to play Notts every week, such is his record against them. The left-hander went into this game having hit 1,063 runs against Notts in 14 first-class matches at an average of 55.95, including four hundreds and a career-best 272 at Scarborough three years ago. Another big score looked in the offing, but Gale felt for a delivery outside off stump from Jake Ball and was caught at second slip by Steven Mullaney for 44. 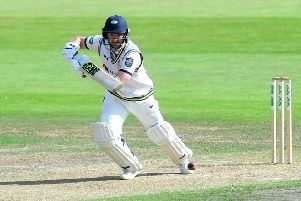 It left Yorkshire 216-6 and ended a gritty innings from Gale, who faced 111 balls and batted for just over two hours. Liam Plunkett arrived and duly accumulated the single he needed to reach 4,000 runs in first-class cricket. The pace bowler has been in fine form with the bat since returning to Yorkshire after the World T20, recording his maiden Championship hundred in the game against Hampshire at Headingley. Confidence is oozing from his every pore, and he took 16 runs off one over from his international team-mate Stuart Broad, who went wicket-less. Plunkett plonked Broad for six over mid-on into the Hound Road Stand and then dispatched him to the mid-wicket and backward-point boundary, Broad conceding more runs in that one over than he did when bowling out Australia here last summer to take 8-15. After Adil Rashid slapped a full toss from Samit Patel to deep mid-wicket, a rank bad shot to a rank bad ball, Yorkshire lost David Willey to a catch behind and Steve Patterson to a skier to mid-wicket that gave Patel his 250th first-class victim. Plunkett reached an entertaining half-century from 52 balls with six fours and a six, but fell to the next delivery when he whipped Jackson Bird to deep mid-wicket to end the Yorkshire innings. With Yorkshire’s bowling impressive from the outset, Notts lost two wickets before the deficit was cleared. Willey took his first wicket for Yorkshire with the fourth ball of the innings, trapping Steven Mullaney, and Greg Smith let go a beauty from Patterson that seamed back in and clipped the top of off stump. After tea, Patterson persuaded former Yorkshire batsman Michael Lumb to edge to Adam Lyth at second slip, and Jack Brooks bowled Alex Hales with one that barely reached half-stump height. There was little Hales could have done about it, but he will emerge from the game with a pair of inconclusive 30s as far as England are concerned. Plunkett rocked back Riki Wessels’s off stump to leave Notts 98-5, but Patel (51) and Read fought hard to add 53 in 17 overs.